There was a chilling sci-fi movie some years ago called “The Stepford Wives.” The families in this film had wives that were just a little too identical, too happy, too perfect. Could there have been a 1945 prequel filmed called “The Stepford Husbands”? This Sears catalog illustration portrays postwar manhood so airbrushed and idyllically that it’s hypnotic and a little spooky. These men are young, unscarred by the war just ended, evidently looking forward to their jobs as “Mad Men” – and nearly indistinguishable from each other. These fellows are practically clones – unique only in the color of their hats. Zoom in on the descriptions and prices that were printed on the next page (and apologies for the blur along the left edge, but this particular catalog was hardback bound and the scanner just can’t deal with the binding). 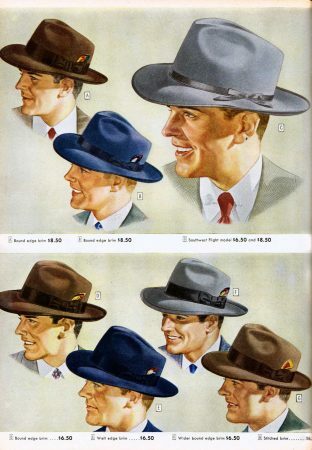 Even the hats seem like clones — 70 years on, if it weren’t for the color we would be hard pressed to tell the styles apart, to pick out the “Southwest Flight” style from the “Casual Swagger”. Actually, all the guys look like they have casual swagger. Was it hats that Sears was selling, or the American Dream? Could one influence the other?